“TUTTI DENTRO!” is not just an architectural project, but a real invitation to enter the house of the great comedian Alberto Sordi, as he has done for so long entering the houses of the Italian public. The villa, one of the most representative examples of private architecture, is transformed into a public place, where to meet, train and organize events. 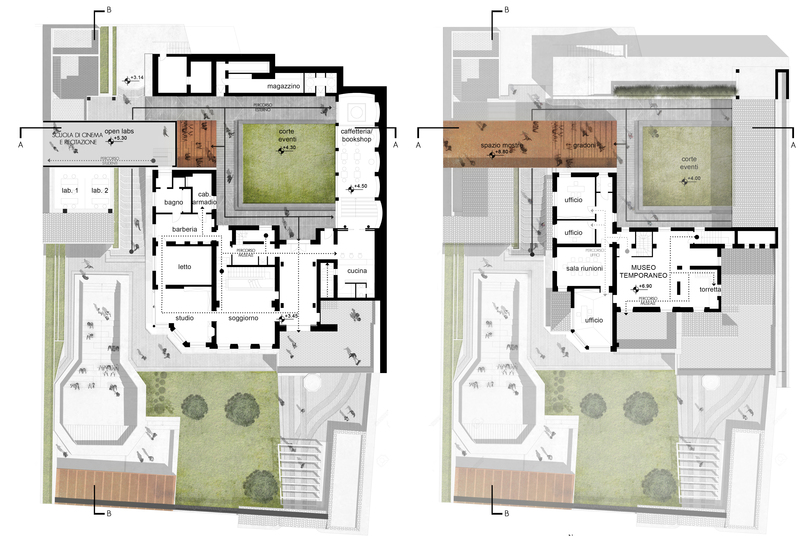 But how the most private building typologies can be transformed into a public place? And, how to intervene without significantly changing its peculiar characteristics? 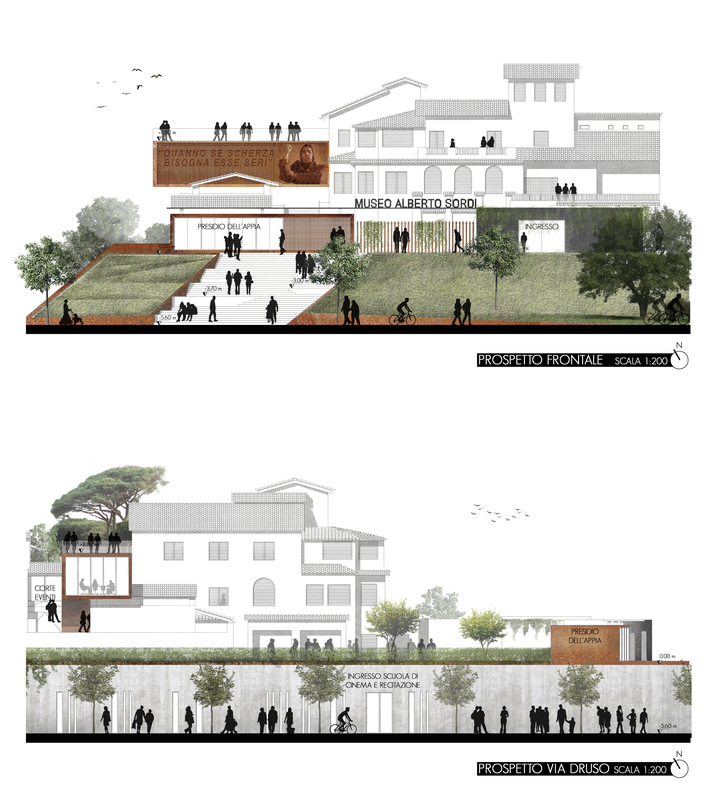 NEW FUNCTIONS, like the Scuola di Cinema e Recitazione and the Presidio dell’Appia, that make it an innovation center, always attracting new visitors. NEW CONNECTIONS, which allow a greater usability of both internal and external spaces, ensuring separation of user, student and employee flows, at different times of the day. NEW VOLUMES, which are jumbled to those pre-existing, and which are not only communicative elements with the city but also new urban landmarks. The city, therefore, is no longer confined to the outside but becomes an integral part of the project, through simple designing operations: the elimination of perimetral fences, massive impenetrable and strongly inclusive walls that physically divide private space from the urban context, and the integration of new volumes and functions in continuous communication with the outside. 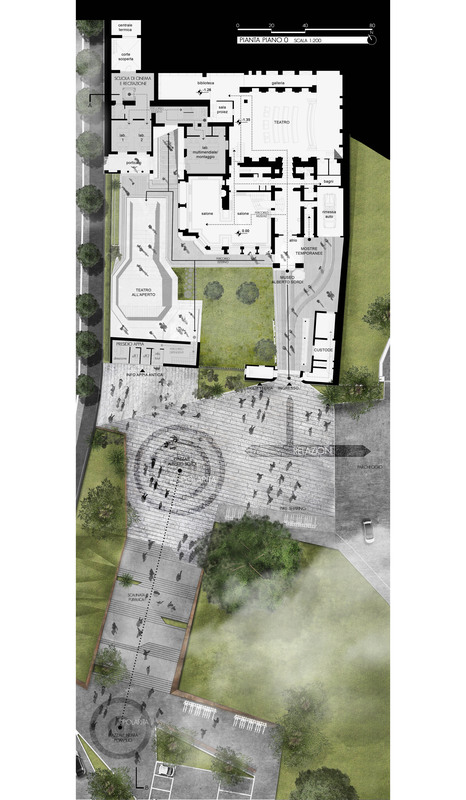 The garden opens onto the public space in front of the villa, creating a real urban square, able to welcome the visitors of the museum and to offerto the citizenship a place of urban quality. The new architectural volumes are engraved on the preexisting ones, integrating them, but remaining clearly recognizable, and characterizing the overall image of the Villa, making it a new urban landmark. Their task is to host new functions, attractive for different types of users, and to communicate actively with the city.